Rear projected interactive window, 5’x6’ in dimension. Ceiling mounted projector and web camera tracking application. As part of a creative campaign with the New Bern/Craven County American Revolution Bicentennial Commission I worked with students in the Art+Design program at NCSU College of Design to develop a series of documentary animations and short films. This was a commissioned studio project between the Craven Arts Council, the Art+Design department and the Advanced Media Lab. A short story format was based on interviews given by the people of New Bern in an effort to participate in their on-going Bicentennial Project. 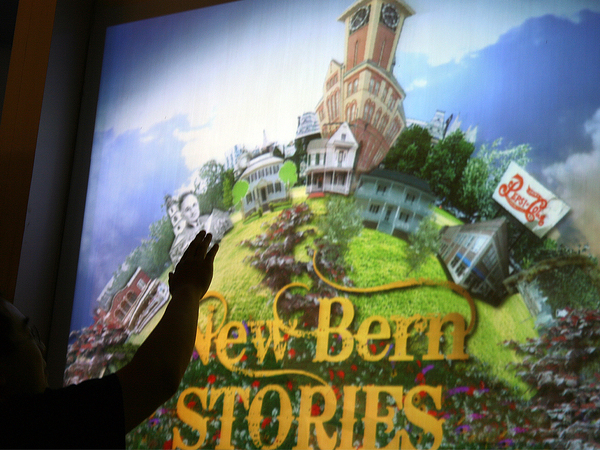 This will provide a historical thumbnail sketch of life as it is in New Bern today and life as it was growing up in New Berlin of yesterday. When the Tercentennial rolls around villagers will be able to see who was here a hundred years before and have a good sense of what our 21st century community was like in its entirety. All the animations were then integrated with an interactive window for display and testing in both an academic and museum setting.